Liam Williams has landed his own BBC Three series spoofing celebrity vloggers, Chortle can reveal. In the mockumentary Pls Like, which he also wrote, the comic plays a semi-autobiographical version of himself, a 'struggling comedian' named Liam Williams who inadvertently becomes a YouTube sensation when a drunken rant he posts online goes viral. Tim Key, Emma Sidi and Jon Pointing co-star in the series, which features a host of character comedians as vloggers, including Jamie Demetriou, Lolly Adefope, Ellie White and Rose Matafeo. Key's character, James Wirm, is an agent who organises a competition to find the next social media superstar, but he ends up stuck with Liam when the public contrarily votes for him by a landslide over a series of six challenges. Sidi and Pointing play celebrity vlogger couple Millipede and Charlie South. The pair want to break up but are contractually bound to stay together by Wirm. Each of the six 15-minute episodes focuses on a specific area of vlogging, including health and beauty, music, gadgets, fitness and pranks. Demetriou appears as a rapper called Bombzy, while Adefope is beauty expert Chloe Sass. White plays the 'Hectic Yogi' Polly Sprong and Matafeo is an American Vine superstar. Yuriko Kotani is a Japanese tech blogger and Mat Ewins, Damien Slash creator Daniel Barker and Flowers actor Hammed Animashaun play online pranksters. 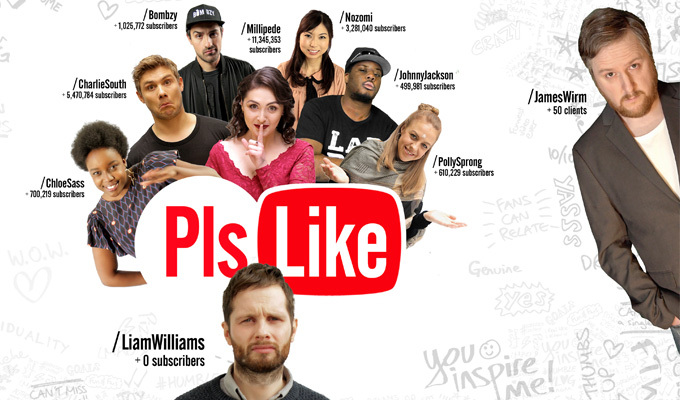 Pls Like was originated from an idea by Olly Cambridge, an associate producer on The Jonathan Ross Show, who also appears in the series, as do comics Katia Kvinge and Nick Coyle. 'I'll be quite interested to see how YouTubers respond to it' producer Rupert Majendie told Chortle. 'Everyone's playing it very real. For the YouTube stuff, we've gone for obvious, bigger spoofs. But it's quite interesting meeting them behind the camera, as their stories play out. The series is set to air in February on BBC Three’s iPlayer and YouTube channels to coincide with the anniversary of the channel moving online. The director is Tom Kingsley, who helmed the films Black Pond and The Darkest Universe, as well as Demetriou's recent Sky Halloween short. The series is made by Left Bank Pictures, whose credits include Cardinal Burns, and the BBC commissioner was Alex Moody. Vloggers like Zoella (Zoe Sugg), command massive followings for their fashion and beauty tips, with nearly 10million subscribers on YouTube. Her debut novel, Girl Online, took the record from Harry Potter creator J.K. Rowling for first week sales when published in 2014. BBC Three has previously recruited popular online comedians such as Crabstickz (Chris Kendall) and TomSka (Thomas Ridgewell) for short form content, with Barker's character in Pls Like, Drexl, a parody of the latter.